SGX ticker at Shenton Way building in Singapore; taken October 2018. Singapore Exchange and the Monetary Authority of Singapore said on Sunday that they successfully developed prototypes to settle trades of tokenised assets across different blockchain platforms, spurring the stock exchange to apply for its first-ever technology patent. Singapore telco StarHub reported on Friday that its third-quarter net profit fell 12.8 percent on-year to S$57.0 million as higher revenue from its Enterprise Fixed services was offset by higher expenses. Lender America 2030 Capital said in a press release dated Saturday that it has retained control of the collateral in the share-loan deal with Singapore-listed Sunpower’s chairman and executive director. Keppel Offshore & Marine’s wholly owned subsidiary Keppel Shipyard obtained a contract valued at around S$30 million to modify and upgrade a production barge for SJ Production Barge, which is a wholly owned subsidiary of oil and gas company KrisEnergy, Keppel Corp. said in a filing to SGX on Friday after the market close. The scope of work includes installing a power-generation module, Electrical House, new accommodation units and other refurbishment works, it said. When the work is completed, which is expected around third quarter of 2019, the production barge will be deployed in the Apsara oil field, which is Cambodia’s first hydrocarbon development, it said. ComfortDelGro said on Friday Gan Juay Kiat, the current CEO of SBS Transit, will concurrently take the appointment of group officer for the bus business, which will assist the CEO to co-ordinate the bus businesses across the group, introduce best practices of bus operations and create synergies of scale for improved efficiency and performance. The company said it considered Gan’s “long and extensive” experience in bus operations in Singapore for the appointment, which included the role of CEO of SBS Transit from 2010 through the present. 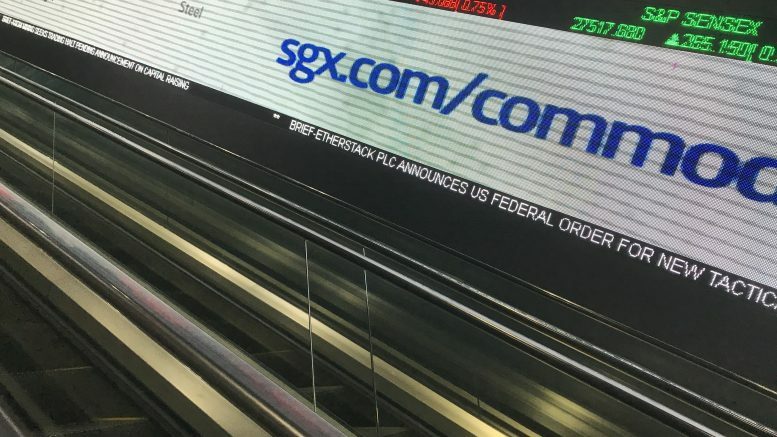 Singapore Exchange Regulation, or SGX RegCo, said on Friday that it was consulting the market over two proposed rule changes for voluntary delistings: the voluntary delisting resolution and the exit offer. Singapore Exchange said on Friday that its total securities market turnover value for October was S$24.3 billion, up 25 percent on-month and 1 percent on-year over 23 trading days, compared with 20 trading days in September 2018 and 21 in October 2017. The securities daily average value was S$1.06 billion, up 9 percent on-month and down 7 percent on-year, it said. Total derivatives volume was 22 million, an all-time high, up 19 percent on-month and 47 percent on-year, it said. Oxley Holdings said on Saturday that its wholly owned subsidiary, Oxley Docklands Quay One, and National Asset North Quays DAC entered an agreement to sell a 300-year lease of a Dublin, Ireland, property to Landings 2 Propco S.A. R.L. for 106.50 million euros, excluding value-added tax. Oxley Docklands will be entitled to 76.84 percent of the sale price, it said. The property is at No.2 Dublin Landings, 72-80 North Wall Quay, Dublin 1, it said. Ascott Residence Trust’s manager said on Friday that it issued S$100 million in principal amount of 3.523 percent notes due 2023 under its S$1 billion multi-currency medium term note program established in September 2009. The net proceeds will be used to refinance existing borrowings, it said, adding the trust had entered a swap transaction to convert the Singapore dollar proceeds into 63.82 million euros at a fixed interest rate of 1.56 percent per annum. United Overseas Bank was appointed dealer for the notes, it said in a filing to SGX on Friday. First Resources reported on Friday that its third-quarter net profit rose 22.2 percent on-year to US$39.00 million on higher production volume, which was partly offset by lower palm oil prices. Lippo Malls Indonesia Retail Trust, or LMIRT, reported on Friday that its net property income for the third quarter fell 15.0 percent on-year to S$39.46 million on a weaker Indonesian rupiah and higher property operating expenses. Roxy-Pacific Holdings said on Friday that it entered a deal to acquire an Australian property from non-profit New South Wales Aboriginal Land Council for A$40.8 million. Silverlake Axis said on Friday that it agreed to acquire 80 percent of Latvia-based digital-identity-verification software services company XInfotech Group, or XInfo, for 17.6 million euros. Silverlake Axis will pay 14.6 million euros on the agreement’s completion and the remained paid over the next two years subject to growth targets and an earn-out consideration, which would depend in part on whether XInfo is able to undertake an IPO. The remaining 20 percent stake in XInfo is subject to a put-and-call option for when certain conditions are met, it said in a filing to SGX after the market close on Friday. “Digital identity and security technologies are natural additions to our capabilities to accelerate digital enterprise transformation in areas such as customer onboarding, customer engagement, payments, anti-money laundering, fraud prevention and cyber security,” Raymond Kwong, SAL’s group managing director, said in the statement. Iconic Singapore chili crab restaurateur Jumbo Group said on Friday that it opened its first franchised Jumbo Seafood restaurant in Bangkok, marking its entry into the Thai capital’s market via a deal with C J Seafood. That deal has an initial term of 10 years and may be renewed for another 10 years, it said. It was Jumbo’s fifth franchised restaurant, with the other franchised outlets located in Fuzhou, Ho Chi Minh, Taipei and Taichung, it said.